In this ebook exclusive novella –the fascinating prequel to Dorothy Must Die – Dorothy travels back to Oz to reunite with old friends, but her story may not have a happy ending. After returning to Kansas, Dorothy Gale has realised that the dreary fields of Kansas don’t compare to the vibrant landscapes of Oz. And although she’s happy to be reunited with Aunt Em, she misses her friends from the yellow brick road. But most of all, Dorothy misses the fame and the adventure. In Kansas she’s just another prairie girl, but in Oz she was a hero. So Dorothy is willing to do anything to get back, because there really is no place like Oz. But returning to the land she left comes at a price, and after Dorothy is through with it, Oz will never be the same. 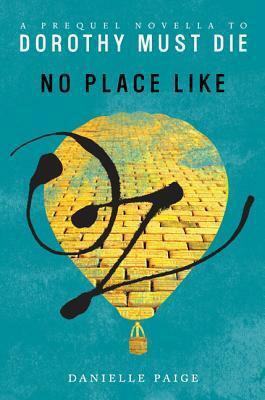 No Place Like Oz is a dark reimagining of The Wonderful Wizard of Oz by L. Frank Baum. Building on its rich mythology, Danielle Paige creates an edgy, thrilling story for teens that chronicles the rise and fall of one of the literature’s most beloved characters.